We examined 43 native perennial flowering plant species during 2003 and 2004 for their attractiveness to beneficial insects, both pollinators and natural enemies (insects that feed on other insects and can control pest populations). Of those native plant species, we identified the 26 that were most attractive to beneficial insects that bloom throughout the growing season. These native plants were historically part of prairie and savanna ecosystems which were common in the central and northeastern U.S. before European settlement. Some of these species are now rare, and all of them are less common than they once were. These perennial flowering plants, in combination with grasses, could be planted in a variety of locations, including home and business landscaping, vineyards, orchards, field crops, and even roadsides. Fiedler, A., J. Tuell, R. Isaacs, and D. Landis. 2007. 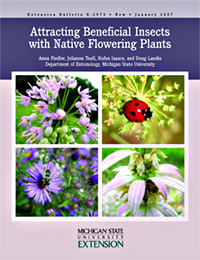 Attracting beneficial insects with native flowering plants. Michigan State University Extentsion, Bulletin E-2973. 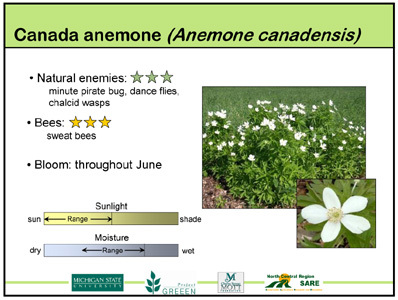 (Available online at:http://nativeplants.msu.edu/uploads/files/E2973.pdf) (verified 4 June 2012). This extension bulletin is a full-color trifold brochure that contains introductory information on the most attractive plants, as well as descriptions and photos of the most common beneficial insects and general information on native plant establishment. It is available online as a PDF, or it can be ordered from MSU Extension. Landis, D., A. Fiedler, R. Isaacs, and J. Tuell. 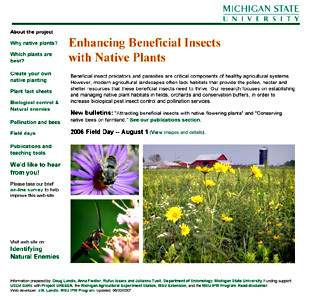 Enhancing beneficial insects with native plants [Online]. Michigan State University. Available at: http://www.nativeplants.msu.edu/ (verified 11 March 2010). Our website contains more in depth information on why and how we did the project. The website includes information on the beneficial and potential pest insects found at all 43 plant species tested, as well as how to locate native seed and plants, and detailed instructions for native plant establishment from seed and plant material. In addition it has descriptions and photos of all the natural enemy insects we collected at these plants. Landis, D., A. Fiedler, R. Isaacs, and J. Tuell. Publications and teaching tools [Online]. Michigan State University. Available at: http://nativeplants.msu.edu/resources/teaching_tools (verified 11 March 2010). In addition to links to a variety of publications, information on which can be found in related pages, there are several presentations available for download as powerpoint or PDF files. Presentations are on three topics: native plants, natural enemies, and pollinators. The native plant presentation includes an introduction to native plants as providers of resources to beneficial insects. There is a slide for each plant with photos, plant moisture tolerance, attractiveness to natural enemies and pollinators, and growth habit. The natural enemy presentation includes an introduction to biological control. For the 19 most commonly collected natural enemy groups there is a slide with photos, a verbal description, and the pests each natural enemy type can control. The pollinator presentation has a description of why pollination is important, photos and descriptions of the major groups of pollinators, what pollinators need to thrive and a list of bee-friendly practices.